Order your Montegrappa Pen of Peace Ballpoint today from FahrneysPens.com. Fine Pens, Refills & Luxurious Gifts – great prices & fast shipping. As the world celebrates the half-century since the Summer of Love, the symbol that embodied it – the peace sign – has increased in relevance and importance. The peace sign is one of the most instantly recognizable designs of the 20th century. Its message is universal, positive and uplifting. In the spirit of goodwill, the idea for the Pen of Peace was born by Montegrappa with the help of its representatives from around the world. To celebrate the peace sign and all it symbolizes, Montegrappa created a limited edition collection to mark the year of its creation in 1958. The fountain pen nib is formed in 18K gold, embellished with a graceful peace dove. Montegrappa has applied the peace symbol, elegantly filled with light blue enamel, to the pen’s cap top and the end of the signature clip. Of special significance is the design that decorates the pen’s resin barrel and cap, its subtle meaning recalling the concept that ‘the pen is mightier than the sword’: engraved with the word for ‘peace’ in 15 different languages. The Pen of Peace is adorned with exquisitely executed calligraphic artwork, specially created for Montegrappa by renowned calligrapher Jake Weidmann. All 15 languages are highlighted by the Pen of Peace’s unique feature: the body holds a special mechanism fitted with micro-ball bearings that allows the barrel to rotate – the user can position his or her language of choice at the front of the pen. 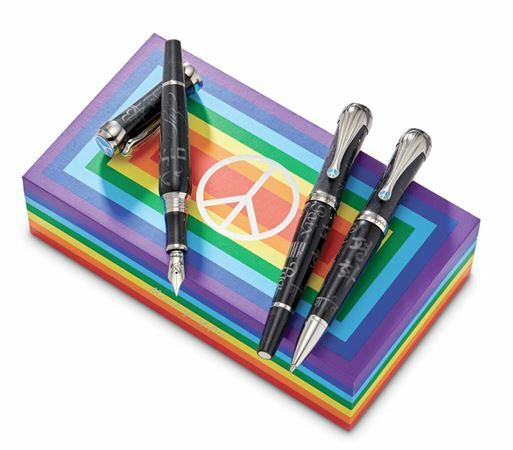 The Pen of Peace can also be had in twist ball pen or capped rollerball models. Each one is shipped in a colorful, custom-designed peace sign box. Limited to 1,958 numbered pieces.